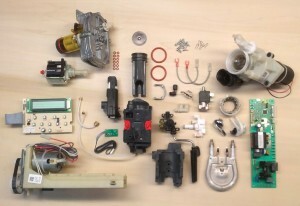 Your premier source for Delonghi Espresso Machine repair in Seattle. From new, the machine works great for several years – it’s quite rare to have any issues at all. Possibly it’s had one small warranty repair or something, but mostly people love their Delonghi machines and the coffee they make. Most other brands need regular (and frankly costly when added up) tune ups and maintenance in a repair shop, but Delonghi machines just don’t need to be brought in for service on a regular schedule. Instead we recommend regular descaling at home, rinsing of the brew unit, and occasional wiping down of the machine. Sometime between 4 and 8 years, you may start to notice issues like leaking, weaker coffee, inconsistent steam pressure, louder than usual sounds, grounds scattered around the inside. Rarely is any of this catastrophic. That’s when you should let us take a look at your machine to see what it needs. With these machines we expect that you’ll only have to put one major service into the machine, and it will have years of life left in it Other service centers or other brands will have you on a yearly tune up schedule, but it just isn’t necessary. Most often it’s a matter of new hose seals, relubrication, tightening fittings, replacing steam valves and boilers, infuser and grinder servicing, physically removing a scale clog or two from the lines – all of this best accomplished in one shot during a complete overhaul. If you don’t live near Seattle, let us help you with the shipping! With our EasyShip program we send you the box, packaging materials and pre-paid shipping label and all you have to do is drop the boxed machine off at any UPS location. This packaging is custom-designed for Delonghi super-automatic machines to ensure that everything arrives safely, and our discount with UPS means you’ll save money on shipping both ways. Once we receive the machine and it works it’s way to the front of the queue we’ll give it a full tear-down and inspection and then call you with a repair quote. If you’re ready to get started just email us. Cleaning of main door interior, coffee spout and all external parts – drip tray, dump box, body panels, etc. Copyright © 2014 Espresso Repair Experts. All rights reserved.